"A light airy, alternative to the traditional pumpkin pie. Water can be substituted for milk if you would like a non-dairy mousse. Originally submitted to ThanksgivingRecipe.com." Pour the 1/2 cup of water or milk into a small bowl and sprinkle the gelatin over it to soften. Combine the milk, honey and spices in a heavy bottomed saucepan and heat until the honey dissolves and the mixture is steaming hot. Add the softened gelatin with its liquid and stir until it is completely dissolved. Beat the egg whites until frothy, then start adding the sugar gradually, beating until stiff peaks have formed. Fold a big spatula of the whites into the pumpkin custard, then fold in the remaining egg whites. Turn the mousse into a 6-cup metal mold that has been rinsed with cold water. Chill mousse overnight. To unmold, dip the mold in hot water for about 30 seconds then invert onto a serving platter. Alternatively, spoon the mousse into individual ramekins or wine glasses that have a tablespoon or two of chopped crystallized ginger and/or gingersnap crumbs in the bottom. Serve with whipped cream. Just made this recipe. It is very tasty but MUCH TOO labor intensive/time consuming. The instructions need to be rewritten to denote systematic order of procedure. I eliminated the sugar, and cut the honey to just 1/2 cup. That is sweet enough for my family! 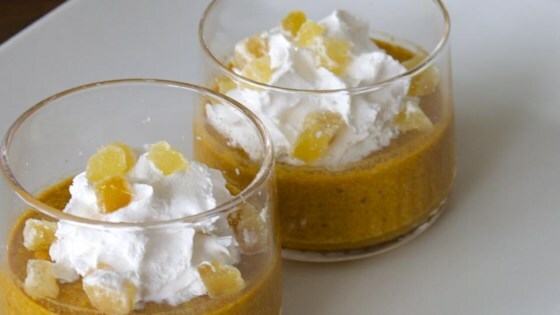 Great tasting spices are in this pumpkin dessert! I'll be making this again!